This is the reverse of the advertisement. In 1789, Andrew Pears, a barber from Cornwall, established a shop in Gerrard Street, Soho, then a fashionable residential area of London. After some 18 years of trading, he realised the market potential for a more gentle cleansing product and developed a high quality, transparent amber soap with a delicate perfume of English garden flowers. This became the most popular of all products sold by A & F Pears. When Francis Pears took sole charge of his grandfather's firm in 1838, he appointed his far-sighted and resourceful son-in-law, Thomas J Barratt as a partner. Barratt pioneered a number of highly original, sophisticated and expensive publicity schemes promoting the message that Pears' Soap was safe and healthy and made its users look more beautiful and youthful. 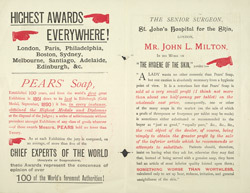 On one side of this advertisement, Mr John L Milton, the senior surgeon at St. John's Hospital for the Skin, gives a glowing testimonial to Pears' Soap. On the other side, the soap is endorsed by Lillie Langtry, the actress known as the "Jersey Lily" on account of her surpassing beauty.